The Stack-On GCWB-10-5-DS Sentinel 10 Gun Security Cabinet holds 10 rifles or shotguns up to 52 inches tall. A steel top shelf provides additional storage for accessories and ammo or can be removed for more space. The shelf is positioned in the back of the cabinet so longer guns can be stored in the front of the cabinet. The Stack On 10 gun security cabinet features a foam padded bottom and barrel rests to reduce the chance of scratches. This helps to keep your weapons looking their best. A three-point locking system with a key coded, double-bitted lock provides greater security for your firearms. It has a black epoxy paint finish with gold accents on the cabinet door. It offers you an attractive and safe way to store your arms. 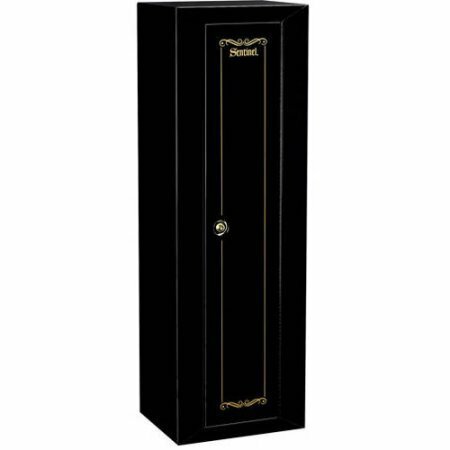 You can display this gun storage cabinet with pride in almost any room in your home. It is slim enough to fit in most spaces. You can rest easy knowing your guns are securely put away.